With the unveiling of the latest live-action incarnation of the Maid of Might going viral faster than a speeding bullet, SUPERMANIA leaps ‘once upon a timewarp’ to compare Super-Fashions thru the ages. While the new small-screen ensemble leans heavily to the modern trend of muted, almost blacked out colours (influenced by, and therefore canon with Zack Snyder’s Man of Steel) its interesting to observe that the basic format of the suit has transcended any excessive studio revisionism and still echoes the movie version years later. Emerging from a decade where the Superhero costume in live action was considered passé and decidedly uncool (pioneered by the producers of Smallville and their ‘no flights, no tights’ rule) its refreshing have the source material embraced fully once again. Indeed, given the creative freedom afforded to other recent DC Comics adaptations like Arrow and The Flash with their ultra-modern twist the fact the mini-skirt and even the classic ‘S’ shield survived intact signifies a welcome return to classic comic iconography. 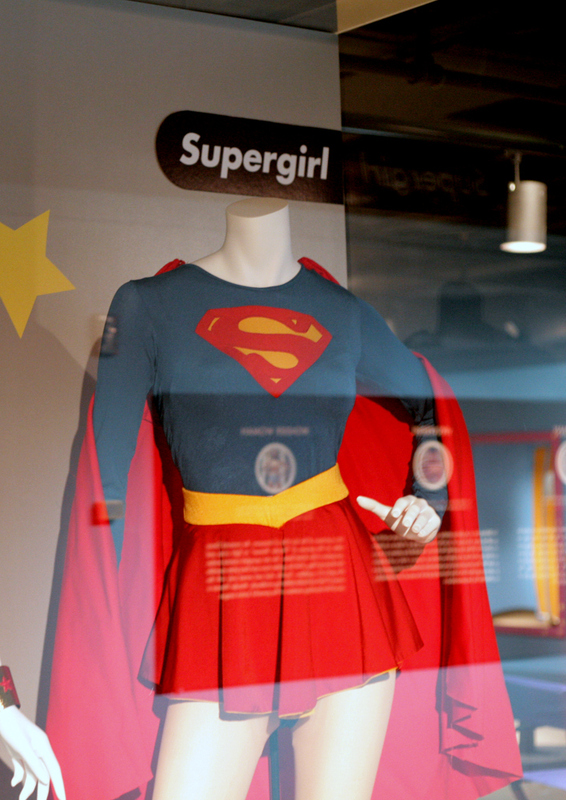 The translation of a comic-book costume to screen is traditionally subject to infinitesimal changes as designer Emma Porteous discovered in creating Helen Slater’s look for Supergirl in 1984. 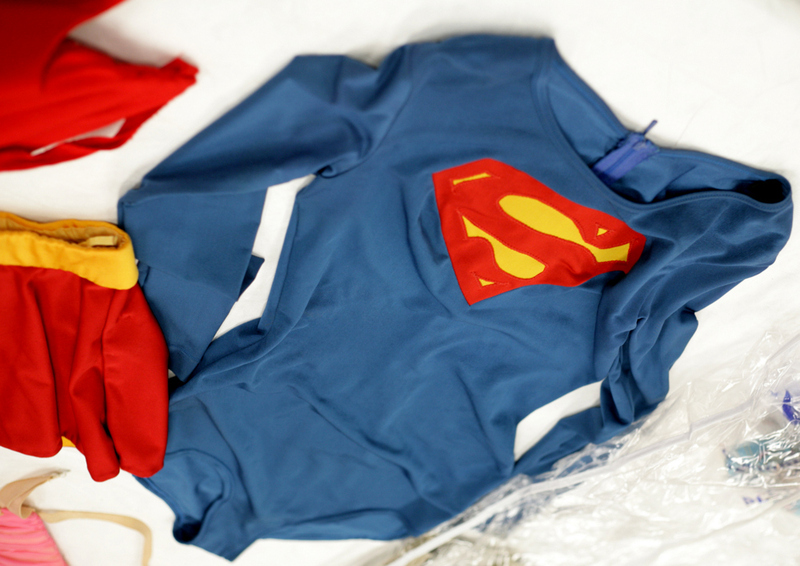 Literally adapting the style seen in the comics of the era, early versions of the costume (as seen in the Making of Supergirl) had the young actress screentest in a baggy suit resplendent with red headband. Successive fittings would eventually realise a feminine version of the Superman costume worn by Christopher Reeve (even utilizing his production-used capes) with the subtle additions of yellow waistband and a two-tone skirt in place of red shorts. 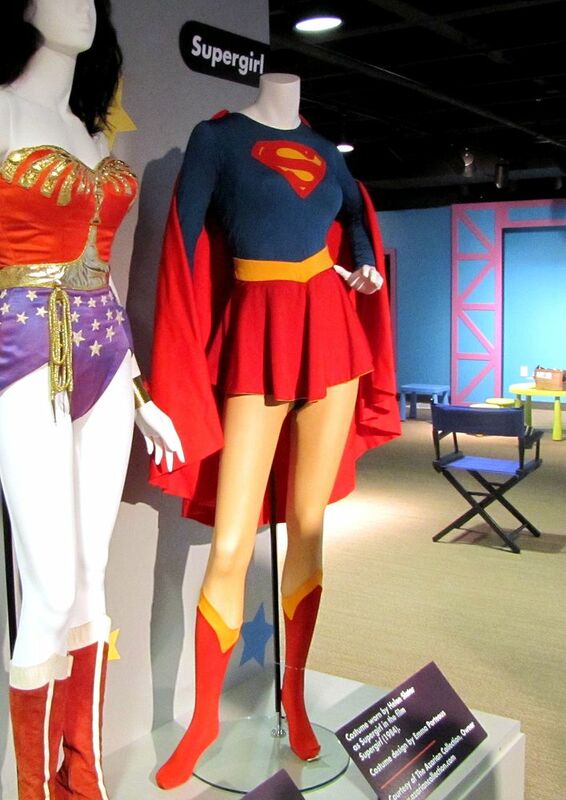 In 2011 The Children’s Museum of Indianapolis was host to a multitude of screenused treasures in their ‘Incredible Costumes from Film & TV’ exhibition, where an original Supergirl costume (on loan from the Azerian collection) was paired with one of Lynda Carter’s surviving season 2 costumes from Wonder Woman (top pic). 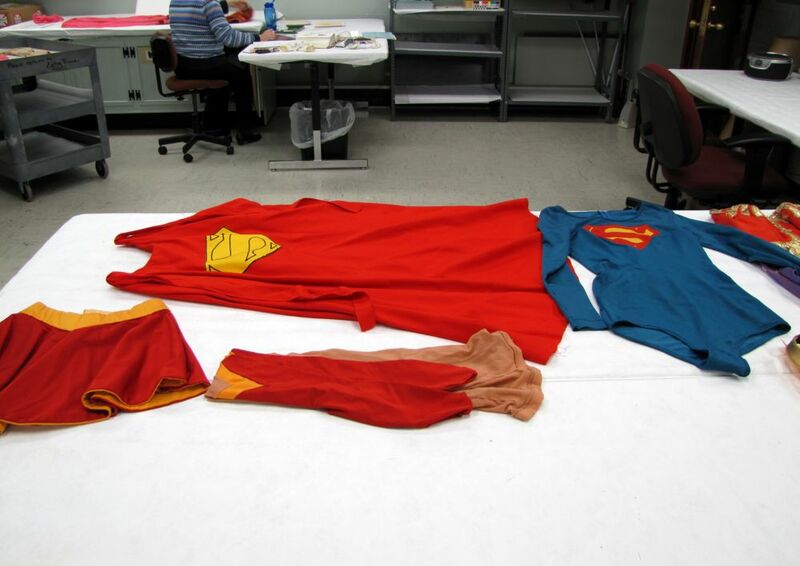 Exclusive images courtesy of their flickr album permit detailed inspection of the costume as it was prepared for display confirming the fabric used was indeed the same ‘Bridal weight spandex’ from the Superman series and that the capes were trimmed considerably (second pic). As the boots were not present to complete the outfit its notable that the tights actually had boot-esque stockings attached to be worn beneath them in exactly the same design with the yellow trim. Construction-wise the suit retains the same patterns as the Superman costume with the exception of the chest shield, which in this instance is so small the complex method of inserting the negative shapes gave way to simply stitching the ‘S’ directly onto the yellow background.